I joined the lovely ladies of the Craft Department at Spotlight in Cairns last night for a staff training night with the fiskars tools. Jenny, Tania, Julieanna, Vicki and Brianna were all treated to a lovely Indian dinner that Nilushi's very talented husband cooked for them, tummies full and it was down to business!! We ran through the shapecutter and templates, eyelet setters/hole punch, squeeze punches, scrapboss, stamping using acrylic blocks and the stamp press, border punches, tool taxi, fingertip control craft knife, the new swivel knife, and the flip and twist corner rounder, paper trimmer including the scoring blade. The girls asked plenty of questions and all had a play and then we all made a card. Considering only one of the girls is a scrapbooker, they did a fabulous job. This is what we made. We didn't get time to do the little bookmark on the left, but they all completed the card. 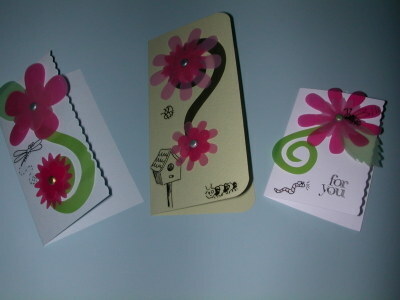 We used the sorbet villa range as well as the squeeze punches and corner rounders on our card. and here are the girls and one VERY messy table by the end of the night, but that means we were creative right?! So on that note, i would like to thank the girls, they all came in off their own backs after hours to learn more about Fiskars tools and products, and were exceptionally friendly and inviting and willing to learn. Well when you read this I'll be on my flight to Sydney........getting ready for our first ever Sydney Fiskars Certified Demonstrator Training Day ........can't wait to meet all our girls! See you at the Show.......WITH A SPECIAL ....FRIDAY! ok here is one of the FREE MAKE'N'TAKES.......you will be able to make one of these Cards each day of the Show during one of our 3 FISKARS CRAFT STAGE PRESENTATIONS each day! Check the times when you come in......we'll be having a FISKARS TOOL DEMONSTRATION with Lyn Dwyer and Jacky McLeod each day......followed by 2 very different FISKARS CRAFT Make'n'takes....one with Jacky (book mark)and the Vellum Flowers Card with Lyn. So make sure you drop by the FISKARS CRAFT GARDEN SHED.......and GARDEN TABLES......in the Living Creatively Area.....you can't miss us! 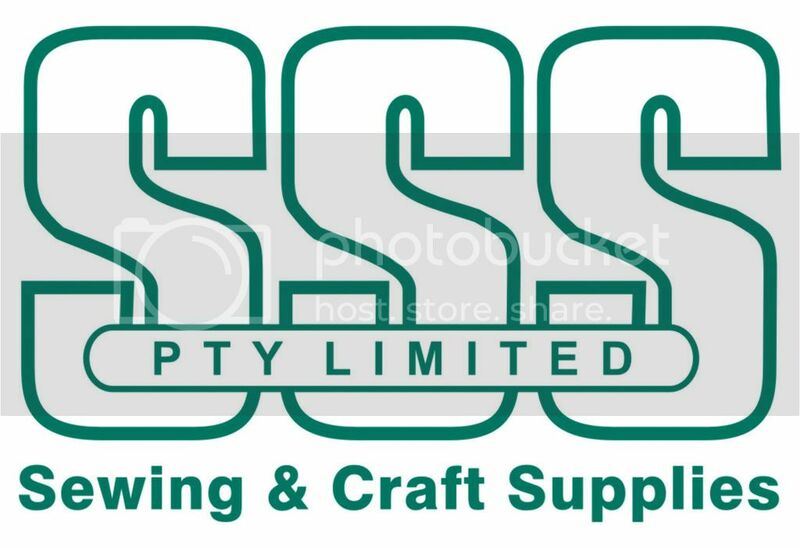 It's going to be so much fun.......Kaisercraft and Birch shall also be in the Living Creatively Area....OMG...it's going to be a CRAFTERS HEAVEN!! 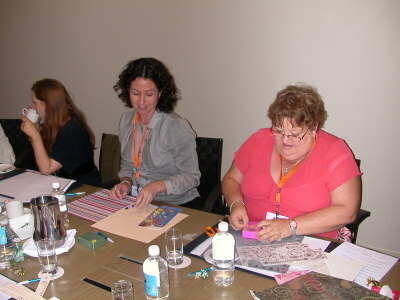 So far this year FISKARS have held 2 very successful Certified Demonstrator Training Days in AUSTRALIA in two different States........Victoria and Queensland........and now it's NSW we head to on August 19th......the day before the Sydney Stitches and Craft Show begins. This promises to be so much fun just getting our girls all together to share ideas and support one another! Trea from Head office is also attending and she will give an overview of FISKARS BRANDS to all participants.........followed by a TOOLS Workshop with Lyn. Looking forward to the day......and we shall be planning more of these training days throughout AUSTRALIA as the need arises! 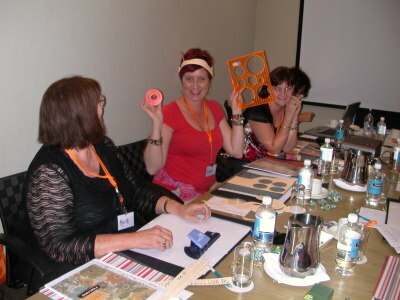 Our next Certified Fiskars Demonstrator Training Day is fast approaching....only 3 weeks from today.....August 19th....in Sydney this time......the day before the Sydney Stitches and Craft Show.....woohoo......the girls will be all fired up and excited and ready to go. Trea and I are looking forward to flying up and facilitating this special day for our Demonstrators......empowering the girls .....sharing ideas....learning a few people skills.....sneak peeks at new products.......etc.etc. Participants have all confirmed their attendance....thanks girls! Here you go girls...Ngaire was delighted to play with the UltraXpress today and boy did she give that circle template a work out.....LOL! It was lovely to have these Brisbane crafters all together playing and learning off one another today at the Mantra(Saville) Hotel in Southbank for the first training day. Trea Surace started off the training session with a bit of company history and background with an informative slideshow and talk.....the girls found this interesting. We then had some lunch.....some sharing of new products and a look at the catalogues.....a bit more chatting and sharing of ideas and experiences and then we ended with a hands=on TOOLS WORKSHOP.......the girls were all given their manuals and goody bags for attending........and once again a BIG THANK YOU to FISKARS for providing all these goodies. The girls also received their business cards and holders today which they can now give out at demos and shows,etc. ok......a few more pics from today...it was lovely to meet these girls...and also for the staff from Living Creatively to participate....thanks Anna,Emilie and Peta. Thanks to TREA for helping me facilitate today's session........and thank you ladies for all attending and contributing to a wonderful day! Well as you are reading this I'm on my way to Brisbane with Trea to prepare for our 12 o'clock Certified Fiskars Demonstrator Training at Southbank. We have 10 participants booked in for the afternoon......including some of the wonderful Living Creatively designers.....these girls do an amazing job of the sets and backdrops they create for Living Creatively....just wait to you see their handy work........they are so very talented and creative! ....and do we have a few surprises for our girls.........woohoo......sh.....sh......not telling just yet or it wouldn't be a surprise RIGHT? Although I have been away for a week I have been also working whilst away on Staffing for 3 Shows,product,projects,etc.as well as in-store demos......so not all holiday.....LOL! Take a peek at some exciting things coming up around Australia! PHEW! !......AND THERE IS MORE TO COME...........so keep checking back in here over the next few weeks.......so much is happening with FISKARS BRANDS!! 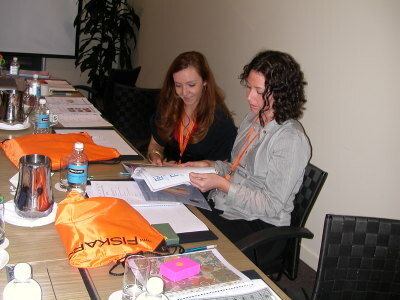 Just a reminder that the next Certified Fiskars Demonstrator Training Day is being held in Australia in Brisbane on April 28th. All Queensland girls who have indicated that they can attend should receive their Invitations in their in-box this week. We are timing these training days prior to major Shows in Victoria, Queensland and NSW. Other States shall follow.....and Trina shall be organising the New Zealand Training prior to SENZ! Sydney at this stage is being planned for August 18th.....more details closer to the date.